Faced with the need to make policy in a rapidly changing economy, Congress is going absolutely the wrong way by planning to cut funding for the Census Bureau to $888 million next year, down from $1.15 billion. The cuts are likely to damage the government’s ability to track the economy on a timely basis, including potentially eliminating the Survey of Business Owners, which tracks the very entrepreneurs who create jobs. To put it another way: If you are steering a car along a dark road at night, you don’t turn off the headlights. Bad data lead to bad policy mistakes. Indeed, if we want to do a better job of encouraging job creation today, Congress should actually boost spending on data that can help make better policy decisions. PPI has suggested that a small amount of additional money for the Bureau of Labor Statistics could help fund a Competitiveness Audit. Such a program could help identify those domestic industries which are ‘near-competitive’ on global markets, so that a small amount of economic development funds could make a big difference for job creation. It’s worth noting that the first set of national economic accounts were created during the Great Depression of the 1930s by Simon Kuznets. All sorts of other economic statistics date back to the Great Depression as well, including comprehensive unemployment figures. The current crisis should be a sign that we need to broaden our understanding of the economy, not narrow it. While I was working out this morning, I was watching the supercommittee hearings on CSPAN (pretty lame, huh). And Doug Elmendorf was explaining all the categories that the committee had to be conscious of…discretionary vs nondiscretionary, defense vs nondefense, security vs nonsecurity. And it struck me that we were missing the most important budget categories: investment vs consumption. Yes, I know that this is an age-old debate, whether the federal government needs a capital budget. But it would really clarify a lot of the debate. The investment budget would of course include physical capital such as infrastructure; human capital such as education and training; and knowledge capital such as R&D. I think that the main thing that the committee should do is protect the federal investment budget. 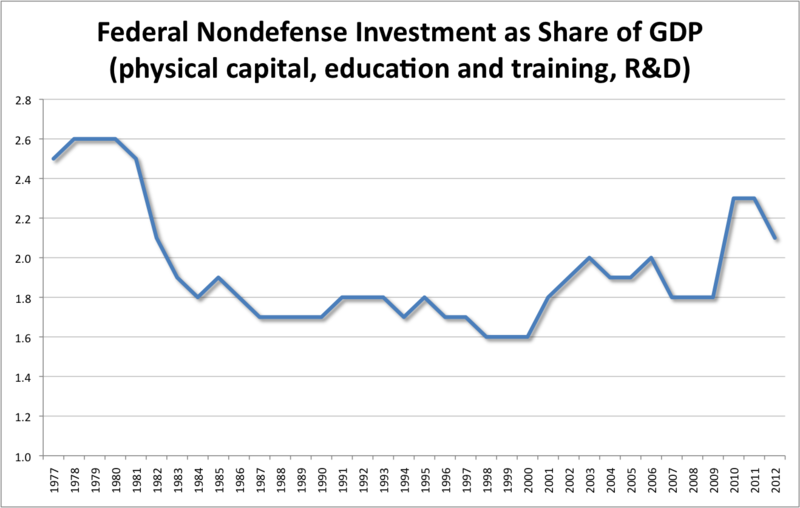 We don’t want federal investment going back to the low levels of the 1980s and 1990s. R&D in the Budget: Half Full or Half Empty? 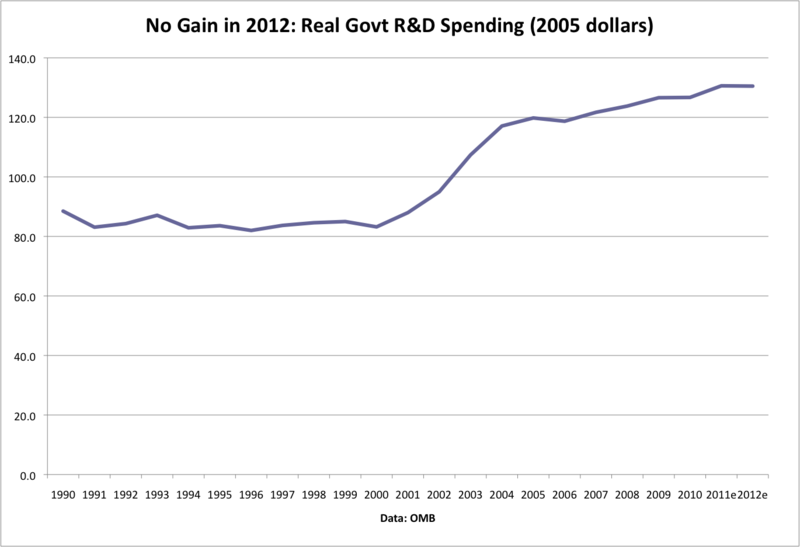 The President’s budget calls for flat spending on R&D, adjusted for inflation. Is this good news or bad news? Depends on what your expectations are. The general reaction was favorable. President Obama sent the research community a valentine of sorts in his proposed 2012 federal budget. Sent to Congress on February 14, the budget was a pledge to fight for increased investment in research and education even as the president committed to a belt-tightening for most segments of federal spending. In sum, whether slightly surreal or not, given the uncertainty of the present environment, it is important and appropriate that the White House has put down a strong marker for investment and growth through innovation even though the 2012 budget dialogue will be focused on cost cutting. Personally, I’ve got a wait-and-see attitude. I worry that the White House is still in a pro-regulatory mood that will encumber innovation. Is the Stimulus Large or Small? I’m going to show you a stimulus chart that surprised me. It’s chart #2, a bit down the page. One important path for economic stimulus is the direct government contribution to personal income–that is, compensation of government workers plus government benefit payments to individuals. Chart #1: The direct government share of personal income is at 29.3%, the highest level in recent history (a thanks to Amity Shlaes, who asked me a question and got me thinking about this again). That’s based on the three months ending May 2010. Chart #2: The direct government contribution to personal income, adjusted for inflation, has increased only 16% in the 2 1/2 years since the beginning of the recession. I was surprised! Direct government contribution to personal income has not increased very much at all, despite the financial crisis. By comparison, the gain in the previous two mild recessions was about 14%. Chart #3. The private sector contribution to personal income has plunged roughly 8%, in real terms, since the recession began. That’s how we reconcile charts 1 and 2. Given the political furor over budget deficits and the size of government, I thought it would be interesting to compare the patterns of government spending in 2007 (pre-financial-crisis) versus 1979 (pre-Reagan-Revolution). First, though, a long-term look at combined government spending at all levels (federal, state and local) as a share of GDP. Remarkably, we see that government spending as a share of GDP moved within a relatively narrow band for a 30-year period. Government went from roughly 30% of the economy in the early 1970s, up to 35% of the economy in 1992, and then down to about 30% again in 2000. Now let’s look at government spending patterns. I’m going to compare 1979 and 2007, which were both business cycle peaks. 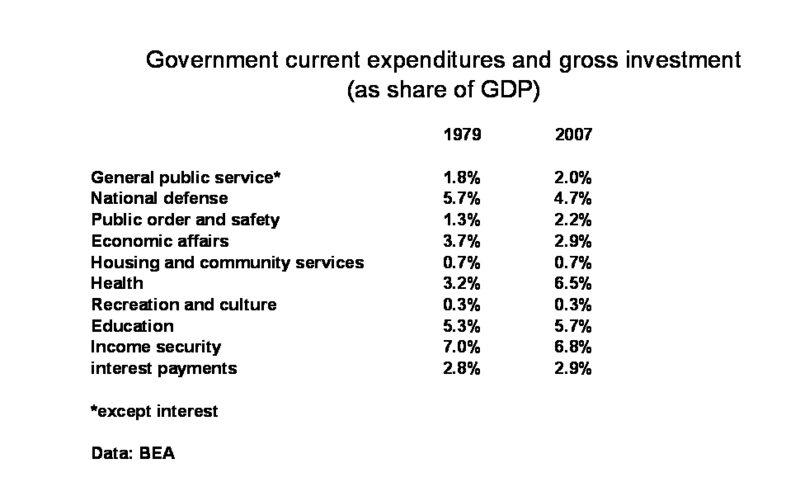 I’m going to use the BEA’s data for government current expenditures plus gross investment (slightly different from the total expenditures charted above). Once again, this includes all levels…federal, state, and local. Of course, 2009 and 2010 (not yet available) would show big changes in the patterns of government spending. But given the long period of stability, we can regard those shifts as a response to the crisis rather than part of a long-term trend. Too Little Spent on the Human Genome Project? Far too expensive. When budgets are limited, you’re forced to generate the data that is easier to get–and cheaper. So when Mandel describes the HGP as an economic flop so far–and he would be inclined to do so since he is interested “the innovation shortfall”–he fails to understand that we didn’t invest in the HGP adequately. Seriously, compare the $3 billion for the HGP to the billions in tax breaks companies get every year for R&D. Or inflation-adjust the Manhattan Project. Let’s not even talk about the Marine Corps’ Osprey program. By comparison, the HGP was done on the cheap. Now there’s an interesting thought. I’ve been going on the assumption that we were spending as fast as the science could absorb the money, but is it possible that we spent too little? The inflation-adjusted cost of the Manhattan project looks in the $22 billion range (Wikipedia number, which I rechecked). In his letter to Congress on June 12, President Obama called for a “Teacher Firing Prevention Fund.” Now, I’m as much in favor of teachers as the next person. My mom was a teacher. I sometimes travel around the country speaking in favor of better funding for early childhood education, which I think is very important. I run a business, Visible Economy, that combines news and education. Human capital, and especially education, is essential for the U.S. economic future. But, boy, if Obama wants to make a case for more money for elementary and secondary education, calling it a Teacher Firing Prevention Fund is just not the way to go. Why not a Factory Worker Firing Prevention Fund? Or a Journalist Firing Prevention Fund? After all, everyone’s pay contributes equally to the macroeconomy–doesn’t everyone’s jobs deserve protection?